1. Mix together onion, bay leaves, carrots, olive oil, garlic, cumin, coriander, salt and black pepper. Add turkey legs and coat legs with mixture. Cover and refrigerate overnight. 2. After 8 to 10 hours of refrigeration, place all ingredients in an oven proof baking pan, ensuring the turkey legs are covered with the olive oil. Add oil if necessary. 3. Cover pan with foil and cook in a preheated 325 degree F oven for 4 to 4-1/2 hours. Turkey legs are done when the internal temperature reaches 185 degrees F plus the fat on the legs begins to break away from the bone. 4. Set aside for 30 minutes and let legs cool to the touch. Remove legs from oil mixture. Strain oil and reserve. 5. Remove leg meat from bones discarding all fat, skin, bones and cartilage. 6. Shred turkey meat with hands, slowly adding ½ cup of the reserved olive oil and juice of one lemon. About 5 minutes of kneading is required to incorporate the oil and lemon juice. Season to taste with salt and pepper. 7. Cover and refrigerate. Advance preparation may be done one day in advance. 1. In a double boiler, over simmering water, heat beaten egg yolks for one minute. 2. While whisking yolks, slowly add warm clarified butter. 3. When the butter is incorporated, stir in lemon juice, truffles, salt and pepper to taste. 4. Hold warm for service. 1. Shred potatoes. Add salt to potatoes. 2. For each portion, mold shredded potatoes around ¼ cup of shredded turkey. 3. Pan fry potato cakes until potatoes are golden brown and turkey is heated through. 1. Crack each egg separately into a small bowl. 2. Add 1 tablespoon vinegar to simmering water. Drop each egg into simmering water, one at a time. Simmer eggs for about 2-3 minutes or until the desired doneness is reached. 3. 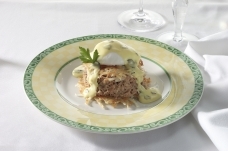 For each portion, place one egg atop a potato cake and nap all with warm Truffle Hollandaise Sauce.